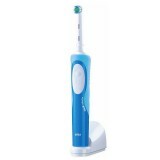 Oral-B Professional Healthy Clean + Gum Care Toothbrush Features Cleaning action: Provides 40,000 pulsations and 8,800 oscillations per minute Professional timer: A two-minute timer with 30-second intervals makes it easy to track how long you’ve been brushing Pressu..
For a deeper, more thorough clean. 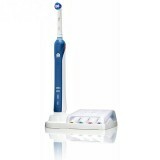 * The Oral-B Vitality Precision Clean rechargeable electric toothbrush reduces up to 2x more plaque*. It uses Advanced Cleaning Technology to surround each tooth and removes plaque for a clean feeling and healthy gums. Superior surface stain removal versus a ..